Critical resources on the economic crisis ... news, links and ACTION! A New Way Forward. Here's where you can PLEDGE TO BREAK UP THE BANKS! Center for Economic and Policy Research. Dean Baker and Mark Weisbrot are co-directors of this center which was "was established in 1999 to promote democratic debate on the most important economic and social issues that affect people's lives." Reports from the Economic Front, by Martin Hart-Landsberg. Working Group on Extreme Inequality. Joseph Stiglitz' website, updated now and again. Nomi Prins' website, updated now and again. James K. Galbraith's website, updated regularly. Nouriel Roubini's RGE Monitor, updated regularly. Michael Hudson's website, updated now and again. Paul Krugman's Blog, New York Times, updated often. Paul Krugman online, columns, books, interviews, etc., W. W. Norton & Company, updated often. William Greider's website, under construction. 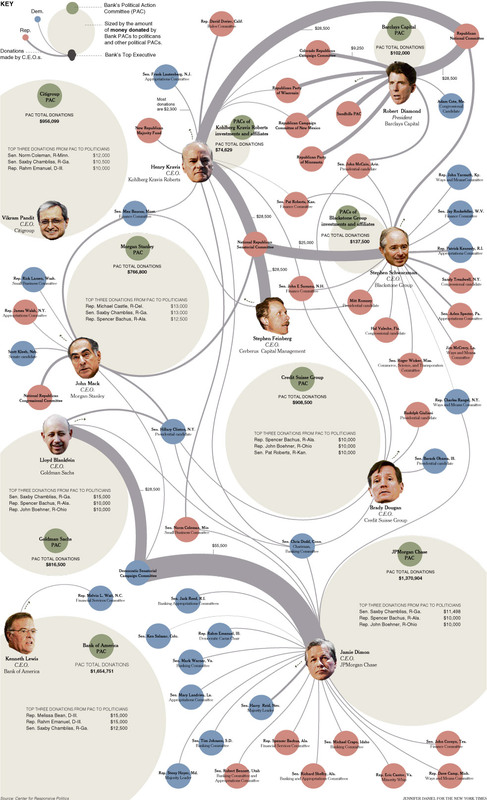 Where Wall Street Trades in Political Currency, Andrew Ross Sorkin, Peter Edmonston, Jennifer Daniel, New York Times, March 26, 2009 ... to check out the map of political influence, click HERE!